Hi everyone! 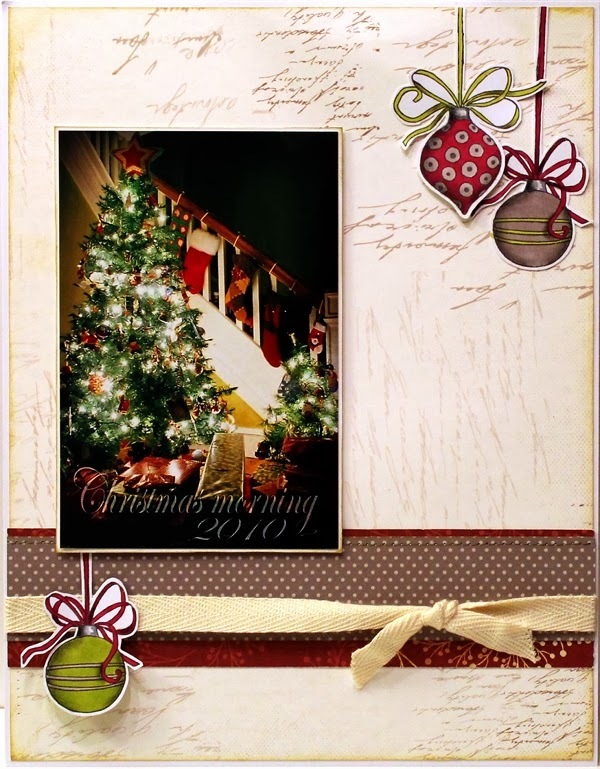 Wendy here and today I'm sharing a 8.5 x 11 Christmas layout. 1. Stamp ornaments in Memento and color with markers. To add a shadow, outline with black colored pencil and blend with baby oil. Cut out stamped images. 2. Trim pattern paper to 8.25 x 10.75 inches. Ink edges with Powder Puff ink and adhere to cardstock. 3. Trim pattern paper and add machine stitiching. 4. Adhere twine and tie knot. 5. Embellish with photo and stamped image. Love the simplicity of your LO, beautiful. This is really gorgeous, love the ornaments! Beautiful layout! I love the way the photo looks on the background paper… stunning!